vs = cart2sphvec(vr,az,el) converts the components of a vector or set of vectors, vr, from their representation in a local Cartesian coordinate system to a spherical basis representation contained in vs. A spherical basis representation is the set of components of a vector projected into a basis given by (e^az,e^el,e^R). 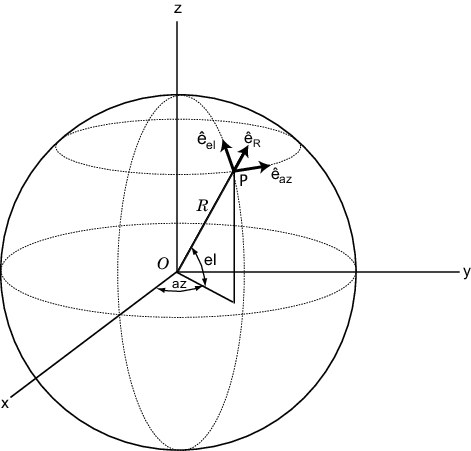 The orientation of a spherical basis depends upon its location on the sphere as determined by azimuth, az, and elevation, el. Start with a vector in Cartesian coordinates pointing along the z-direction and located at 45° azimuth, 45° elevation. Compute its components with respect to the spherical basis at that point. Vector in Cartesian basis representation specified as a 3-by-1 column vector or 3-by-N matrix. Each column of vr contains the three components of a vector in the right-handed Cartesian basis x,y,x. Spherical representation of a vector returned as a 3-by-1 column vector or 3-by-N matrix having the same dimensions as vs. Each column of vs contains the three components of the vector in the right-handed (e^az,e^el,e^R) basis.